A strategy around originality helps you gain and keep an audience. Here’s the paradox of living in the information age: We have access to all the information we want. But it’s hard to exactly replicate someone’s success. You would figure that because a great creative company or a popular musician puts everything about themselves online, then anyone can simply copy their work, present it to the world and see their cash register ring. This kind of copycat behavior happens anyways, but it doesn’t work. It’s nice to know that if you are selfish and lazy then you don’t get an easy free pass to success off of the creativity and hard work of someone else. Selfish and lazy can get you some traction, but it’s a poor strategy to truly win. That’s because you still have to pay the price of making a connection and being the leader. Though technologies continually change, the nature of human beings is pretty predictable. We still do business with people we like and trust. And we like to pick winners. Thus, your strategy for winning customers and growing a business has to come from building your own tribe, leading them and gaining permission to sell them something. It’s less about what you sell than it is about who you are in many cases. If I can find a competitor to what you sell, then I have just commoditized you and that choice changes the equation. But if I can see you are unique and indispensable, then in my mind, you are special. Part of being special means we connect and resonate. I tune into your message and who you are. It’s how we pick our friends and very similarly how we pick who we do business with. In advising consulting clients, I don’t spend so much time looking at how others do things. It’s more about who cares to connect and why. The vibe you give off and passion you exude will both attract and repel people. Some people may not like that reality because it’s not easy. But the sharper the contrast, the more loyal your true tribe will be. That strategy helps you to create something special. It will work for you and not necessarily for someone else, just like your friends are not my friends. When given a choice, the better strategy is to spend time and energy discovering, pushing on and promoting who you are and not mimicking someone else. It will come out in all the pieces and ways you engage the marketplace with. Oh, and by the way, we are pretty good at detecting inauthenticity and copycats. It’s a waste of time. 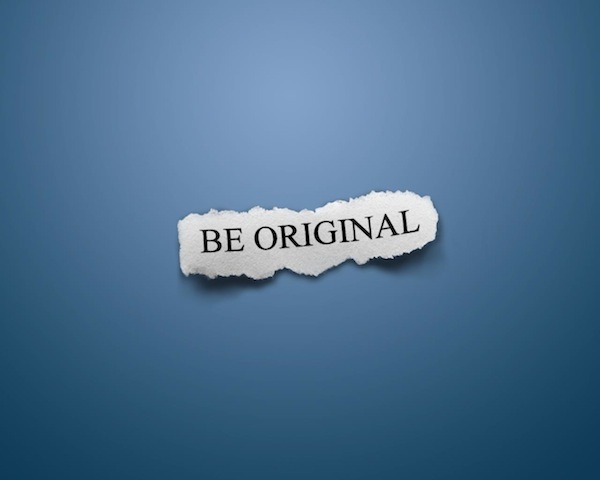 Better to pursue your originality instead.